Lemon essential oil is defined as oil that is processed from fresh lemon peels, which is used as a food additive by enhancing the traditional lemon flavor. Lemon essential oil is generally manufactured by the cold pressed method, wherein, the fresh fragrance of lemon is maintained throughout the process. Due to its exotic fragrance, lemon essential oil also finds remunerative application in the cosmetic and personal care industries, along with food and beverages. Lemon essential oil is a highly concentrated flavoring ingredient, which enables its huge industrial application. The demand for natural food flavors such as lemon essential oil in China and India is expected to increase during the latter years of the forecast period. This is primarily attributed to the launch of new products with natural ingredients, such as lemon extract, concentrates, and others. In Asia Pacific, lemon essential oil is the most preferred flavorant among other citrus flavors. Among the nature segments in the lemon essential oil market, the organic lemon essential oil segment is expected to register the highest growth rate of around 6.6%, owing to increased consumer health awareness regarding organic products due to their health benefits. However, the conventional lemon essential oil segment had the highest market share in the year 2017, owing to its affordable prices and accessibility. Aromatherapy is the treatment of certain minor physical conditions using aromatic essential oils for relaxation, rejuvenation, and focused concentration. Practitioners of this therapy consider that the aroma of natural, organic, and concentrated oils can have several vitalizing benefits on the body. Lemon essential oil can be used in various ways, such as through inhalation, massages, bathing, showers, perfumeries, and others. There is an increasing demand for therapeutic and aromatic oils such as lemon essential oil across the world, due to the growing preference for harmless, convenient, and natural alternatives to traditional allopathic solutions. Thus, the shifting consumer preference in aromatherapy directly contributes to the revenue increase in the lemon essential oil market, and is therefore an important driver for market growth. The other advantage is that, lemon essential oil is priced much higher than all other products in which lemon essential oil is an ingredient. Lemon essential oil is used as a key ingredient in home care products as a source of fresh aroma and due to its detoxifying property by eliminating harmful microbes present in the closed environment. This property makes lemon essential oil ideal for use as a surfactant, and in household cleaners and sanitary products. The increasing demand for lemon essential oil in home care products is anticipated to increase the consumer preference for cleaner and safer cleaning solutions. Limonene is a key component of lemon essential oil, and imparts several of the beneficial properties associated with lemon essential oil. Limonene can be a replacement for several other solvents such as acetone, mineral spirits, glycol ethers, and toluene. Thus, lemon essential oil is expected to have extensive application in home care products during the forecast period. The excessive use of antibiotics for promoting animal growth and preventing livestock diseases has led to antibiotic resistance in most farm animals. This antibiotic resistance is further transmitted to humans when the meat of farm animals is consumed. The high consumption of meat has escalated this problem to concerning levels, with antibiotic resistance being considered as a significant threat to humans across the world. Oils derived from citrus peels, such as lemon essential oil, are considered as potential alternatives to animal feed antibiotics. Lemon essential oil is expected to be an ideal alternative to antibiotics, as it has the potential to induce growth in animal, and also helps in preventing diseases. Thus, lemon essential oil is expected to have greater opportunities in the animal feed industry during the forecast period. The increasing demand for beverages in the regions of Western Europe and Latin America is expected to create vital opportunities for dynamic players in the global lemon essential oil market. The ever-rising demand for nutraceuticals with natural ingredients and flavors is also expected to result in the significant sales of lemon essential oil for processing these products. Key players operating in the lemon essential oil market are expected to leverage this opportunity during the forecast period. Food and beverage companies are highly focusing on research and development activities to enhance the nutritional and multifunctional profile of lemon essential oil that offers more health benefits. Bound to all the above driving factors, it is anticipated that, the global lemon essential oil market would proliferate in terms of value and volume during the forecast period. The proposed market report of TMR on the global lemon essential oil market evaluates opportunities in the current market, and provides latest updates and insights corresponding to various segments involved in the global lemon essential oil market over the forecast period 2018–2027. The report on the global lemon essential oil market provides historical data of 2013, along with the estimated data for 2018, and forecast data up to 2027 in terms of value (US$ Mn) and volume (MT). In terms of value, the lemon essential oil market is anticipated to increase at a CAGR of 5.5% during the forecast period. The present study exhibits the trends and market dynamics of the lemon essential oil market in five major regions - North America, Latin America, Europe, Japan, Asia Pacific Excluding Japan, and the Middle East and Africa. The report also includes the study of current issues with consumers, and various future opportunities for the lemon essential oil market. The report explores the global lemon essential oil market for the period 2018–2027. The primary objective of the global lemon essential oil market report is to provide insights into key developments in the market that are consistently supporting to transform global businesses that are associated with the lemon essential oil market. It is very important to consider that, in an ever-wavering economy, we provide the estimated (Y-o-Y) year-on-year growth rate in addition to the Compound Annual Growth Rate (CAGR) for the overall forecast, to understand the better analysis and evaluation of the global lemon essential oil market, and to discover equitable opportunities. Yet another key feature of this report is that, the estimation of the global lemon essential oil market and the corresponding revenue forecast is carried out in terms of absolute dollar opportunity analysis. This is usually not prioritized while forecasting the overall market numbers. Absolute dollar opportunity analysis is very essential in evaluating the degree of opportunity that a provider can observe to execute, as well as to contrast the potential resources from a sales perspective in the global lemon essential oil market. The global lemon essential oil market report starts with an elaborate executive summary, the market definition of various segmentations that are included, and their respective shares in the global lemon essential oil market. The report further incorporates the major macroeconomic factors that have an effect over the growth of the lemon essential oil market. The market report also highlights the various market dynamics, which includes the drivers, restraints, opportunities, and trends in the global lemon essential oil market. The report further underlines the study of present issues with industrial processing, and opportunities for the lemon essential oil market. It also encompasses value chain analysis, which provides a structural view of overall profitability from the manufacturer to the end use in the lemon essential oil market. In order to provide users with a clear view of the global lemon essential oil market, we have exhibited a competitive analysis of key market players and their strategic expansions. The competitive dashboard presents a detailed comparison of lemon essential oil manufacturers on valuable parameters such as key product offerings, total revenue, key developments, and key strategies. The study intensifies the global lemon essential oil market attractiveness analysis by nature, end use, distribution channel, and region. To evaluate the overall market size of lemon essential oil, the report considers various fundamental aspects based on secondary research. Furthermore, it emphasizes quantitative evaluation such as market share by nature, end use, distribution channel, and region, and other qualitative data from primary respondents, which have been consolidated to arrive at clear and accurate market estimations. The forecast provided in the lemon essential oil market report concludes at the total revenue being generated, and the expected revenue contribution in the future by the global lemon essential oil market. Detailed profiles of companies that manufacture lemon essential oil are included in the report to analyze their developmental strategies, key product offerings, and recent developments, as they have a significant role in the global lemon essential oil market. 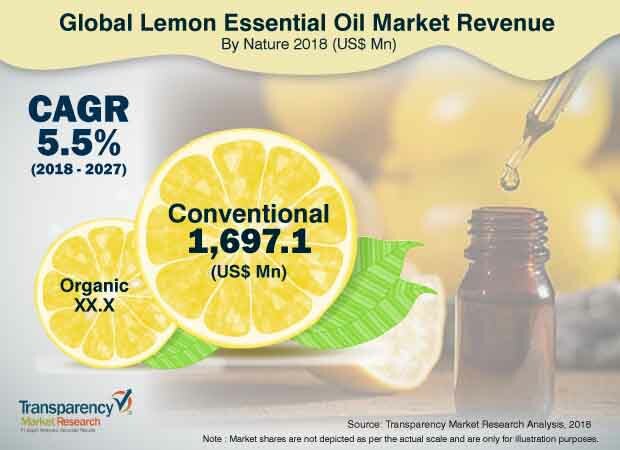 Major market players covered in the lemon essential oil market report are NOW Health Group, Inc., Citromax Flavors, Inc., doTERRA International, Southern Flavoring Company, Inc., Lionel Hitchen Essential Oils Ltd., Aromaaz International, Sunshine Products, Inc., Citrus and Allied Essences Ltd., and others.